Jason and Marco on the strip. This was a few weeks ago, but Finals prevented me from chronicling anything interesting in my life, so I've go some catching up to do. I went with a few of the other broadcasting students at BYU to the RTNDA@NAB show in Vegas (as you may have noticed). I was going primarily to learn more about the industry I'm about to be a part of, but there were also abundant networking opportunities, including a career fair for students. 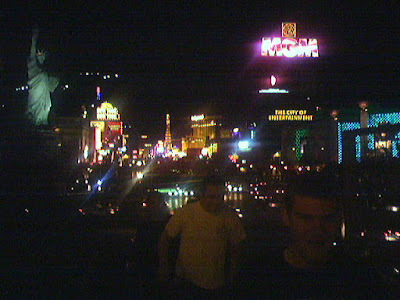 I didn't take many pictures, because I felt like Vegas was just so gaudy, there wasn't any space for creative outlet. I was wrong. This guy managed to take some good shots. There were more interesting people, companies, and equipment than I could have possibly seen during the week. Caitlin and Marco posing. Caitlin was volunteer secretary for the day. We showed up Saturday night. Nothing started till Sunday. I made the mistake of not really reviewing the program thoroughly, and went to the convention center on Sunday, thinking there would be something going on. There wasn't. But it got better, I promise. There is a Star Trek themed restaurant in the Hilton where the convention was at. Whatever gimmick works. I went to a number of addresses while there. I tended toward the more technologically progressive topics. I attended the "20 Tricks, Tips, and Widgets for your Website". It was geared towards newsrooms that want to capitalize on free, easy media add-ons to their website. I'm amazed how often this doesn't happen. People were asking questions of the panel, and I wanted to raise my hand and answer, but refrained, seeing as I'm a visiting student, not one of the industry pros on the panel. I talked to Steve Safran afterwards and mentioned that. He said in no unclear terms I should have answered their questions, that's how people notice you, that's how you get job offers. Duly noted, Steve. 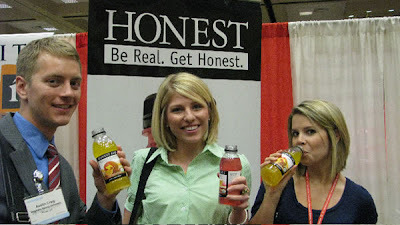 From the booth of Honest Tea. Don't worry, we just got non-tea drinks. Honest. I went to another panel discussion on making user generated content part of your overall news strategy. It was fascinating. I just can't shake the feeling that this will be a huge part of how news works in the coming years. Dan Beckmann was there from Current TV, the cable network cofounded by Al Gore. Fully 1/3 of Current's programming comes from user generated content, i.e. I make a piece, send it to them, and if they like it, they pay me and run it. I already have footage of something I want to send to them, I just have to edit the piece. He was a fine speaker, but I was riveted by the subject matter. Talked to him afterward, got his card. He said they have curriculum material for groups focusing on new media. I said I'd contact him about the possibility of setting that up at BYU. Still need to do that. This, ladies and gentlemen, is the greatest student anchor in the country. Honest, he won that award. There was a booth selling makeup supplies, Marco was lucky enough to have a sampling. Kellie, Annie, and Josh taking a break between sessions. It must have been Monday night, we were bored, not really doing anything, so went Siovhan, Brett, Marco and I went outside for a walk. Around the block, behind where we were staying, there was a stake park, with a group of kids who were awesome to watch. They were a diverse bunch, not typical "skater" that you would have thought of from the 90's. They were black, white, hispanic, wearing all different styles of clothes. There weren't any sociological barriers that I could see. Just a bunch of guys who all wanted to skate. It was really cool. Instead of walking around the block again, we decided to jump the fence to the place we were staying. Seemed like a good idea at the time. Brett stood on a trash barrel next to the fence to climb over, when the barrel came out from under him. His fingers caught on something sharp, barrel or fence, I'm not sure. What I am sure of is how mangled his first two fingers were on one hand. Marco drove him to the hospital, Josh and his iPhone offered directions, and Siovhan offered as tender of care as any mother I've seen. Good job, team. I was worthless in the face of blood. Couldn't even look at it, much less take a picture. 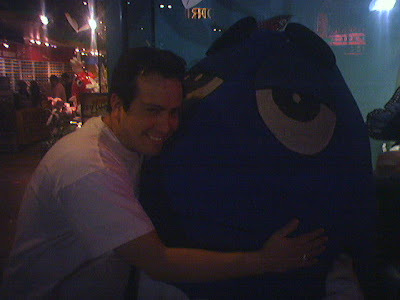 Marco giving Blue some love at the M&M shop. The NAB Show was huge. Alvin and Heidi Toffler were fascinating. I loved it, they confirmed so many personal convictions about society, technology, politics, culture, the list goes on. I tried to record the discussion, and it actually turned out okay. If you're interested, you can listen here. Obviously you missed the initial gagging I did when I first saw all the blood. ...The after effects of the experience made for quite the trip. It's a good thing I can play mom.